This section of the website provides links to the Justice Press Office where press queries should be directed and to an archive of Press Releases and Other News items. News items will be added as they arise in due course. Mr David Stanton TD, Minister of State with special responsibility for Equality, Immigration and Integration, has announced details of Phase 3 of the comprehensive consultation process in relation to the development of a new National Traveller and Roma Inclusion Strategy for 2016 - 2020. The consultation process allows interested parties to make submissions in key areas such as anti-discrimination and equality, cultural identity, accommodation, health, employment, education, gender equality, public services and children and youth. 3. a third phase of consultations (now) to focus on identifying precise and measurable actions for achievement of each of the objectives that emerged from Phase 2. At the end of Phase 3, a final draft of the Inclusion Strategy will be prepared by the National Traveller and Roma Inclusion Strategy Steering Group and will be then submitted for consideration and sign-off by Government. A total of 38 submissions were received in Phase 1. These submissions were analysed by the Department of Justice and Equality with the help of Pavee Point. There was a high level of participation in Phase 2 among interested parties and it is hoped that the forthcoming (Phase 3) consultation sessions will be even more successful. A copy of the current draft of the Inclusion Strategy can be found HERE. Mr David Stanton TD, Minister of State with special responsibility for Equality, Immigration and Integration, attended the Traveller Pride Awards which were held in the Pillar Room in Dublin on 01 June 2016. The Traveller Pride Awards ceremony is the lead event for the annual Traveller Pride Week programme which is a showcase for all that is positive about the Traveller community in Ireland. Prizes were awarded in a wide range of categories including youth, community action, education, music, the arts and sport. 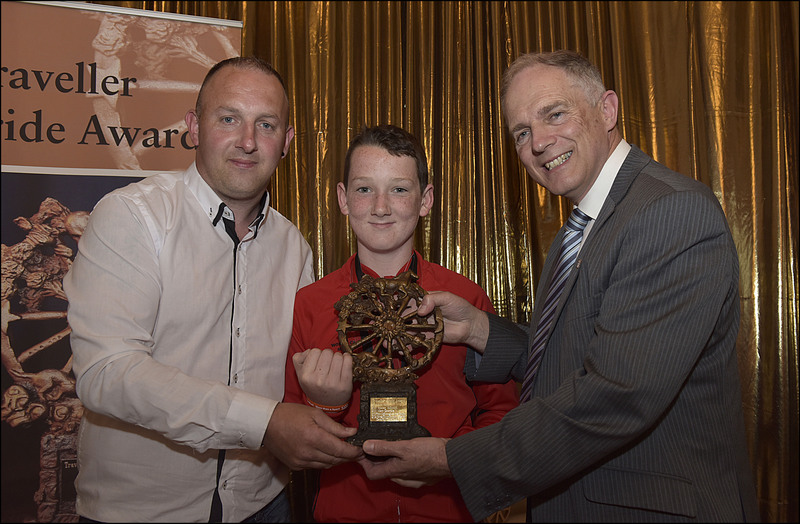 The Minister of State, with last year’s overall winner Mr Hugh Friel, presented the overall award for 2016 to Mikey Kelly. Mikey is a 12 year old world champion handball player and a member of the Traveller community. The Minister of State congratulated Mikey on this huge achievement and said that Ireland was proud of him. Minister Stanton congratulated all of the winners and thanked their families and communities for the support they provide to enable such positive energy and commitment to come forth. Minister Stanton said that he was impressed and inspired by the array of wonderful skills, talent and dedication evident in the Traveller community. He added that it was clear to him that Travellers have huge potential to contribute fully to Ireland if the barriers to their participation in society are removed. He committed to working with them on the new National Traveller and Roma Inclusion Strategy, the drafting and implementation of which he is leading on a cross-Departmental level. The Minister of State for New Communities, Culture and Equality, Aodhán Ó Riordáin, T.D. has today announced that he is seeking expressions of interest from suitably qualified and experienced persons for consideration for nomination to the List of Experts Eligible to serve on the Advisory Committee under the Framework Convention for the Protection of National Minorities (FCNM). Ireland's next (4th) report to the Council of Europe on the Framework Convention for the Protection of National Minorities is being prepared by the Department of Justice and Equality and is due in September 2015. Membership of the FCNM advisory committee is filled from within Member States by rotation. Ireland is not currently eligible for a permanent place. However, Ireland is entitled to have an additional member present when our report is being considered and it is important that we avail of this opportunity. The FCNM Advisory Committee is the independent expert committee responsible for evaluating the implementation of the Framework Convention in State Parties and advising the Committee of Ministers. The results of this evaluation consist of detailed country-specific opinions adopted following a monitoring procedure. This procedure involves the examination of State Reports and other sources of information as well as meetings on the spot with governmental interlocutors, national minority representatives and other relevant actors. The Advisory Committee is composed of 18 independent experts. In accordance with Resolution (97)10 of the Committee of Ministers, members of the Advisory Committee shall have recognised expertise in the field of the protection of national minorities. They shall serve in their individual capacity, shall be independent and impartial and shall be available to serve on the Committee effectively. Members must also have a good command of either English or French. Consideration will be given to all applications received from suitably qualified individuals. The call for applications is available on www.travellerinclusion.ie and on www.justice.ie with a deadline of 10th July 2015 for receipt of applications. On consideration of applications received, the Government will select and nominate two persons to the Secretary General of the Council of Europe. Selection of the successful candidate will then be for the Council of Europe’s Council of Ministers.